The Worcester City side which arrives at Bramall Lane tomorrow will not, Neill Collins suspects, be the same as the one that faces Stalybridge Celtic next weekend. A first round tie against opponents three leagues below them on the footballing pyramid should, Collins conceded earlier this month, guarantee Nigel Adkins’ squad safe passage through to the second round. But in FA Cup competition, as United demonstrated themselves by beating Aston Villa, Fulham and Nottingham Forest en route to the semi-finals 19 months ago, things are seldom as straight forward as that. City, managed by club legend Carl Heeley and with experienced players like Deon Burton and Lee Hughes at their disposal, know they have everything to gain and nothing to lose. Which, Collins acknowledged, makes them dangerous opponents. United do not enjoy the same luxury after seeing their bid for the Championship falter in recent weeks. Defeats to Millwall and most recently Crewe Alexandra has prompted some observers to question whether Adkins’ team is capable of justifying their pre-season billing as promotion favourites. 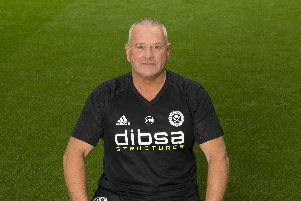 Collins, the former Sunderland, Wolverhampton Wanderers and Leeds centre-half, has a crucial role to play as they look to survive the most difficult period of Adkins’ reign so far. Collins, who has made nearly 200 appearances for United since leaving Elland Road in 2011, believes the visit of opponents ranked 20th in National League North, can mark the start of the healing process. Nevertheless, as Collins acknowledged, that can be easier said that done.